Fernand Braudel in his seminal essay History and the Social Sciences: The Longue Durée pointed out that many academic disciplines/fields which study different aspects of social life inevitably encroach upon their neighbors, yet often remain in “blissful ignorance” of each other. Braudel, and others have repeatedly called for historians and social scientists to overcome their deep ontological and epistemological differences in order to work together. beneficial to their research, as well as emerging trends and themes. A three-day conference will take place in Venice, one of the great hubs of early modern communication, at Warwick University’s seat in Palazzo Pesaro Papafava. The opening keynote address will be delivered by Professor Mario Infelise, a leading scholar of early modern print and journalism and the head of the graduate program in the Humanities at the University of Venice Ca’ Foscari. Instead of traditional panels and papers, the conference aims to foster dialogue among scholars of various disciplines through topically organized round-tables, master classes, and countless opportunities for informal discussions. The organizing committee invites scholars to submit abstracts of max. 400 words in which they address one of the main themes listed below and outline a short intervention that they might contribute to a round table on that theme. Such interventions should focus mainly on theoretical or methodological approaches, issues and experiences that the speaker has engaged with in his/her research. Historical case studies can be presented only so far as they contain a high degree of historiographical/theoretical significance. Interdisciplinary roundtable sessions will be organized in which participating scholars will also discuss questions raised by a chair and the audience, based on these proposals. The deadline for abstract submission is January 10, 2015. The conference registration fee will be 140 euro and participants will be asked to cover their own travel expenses. 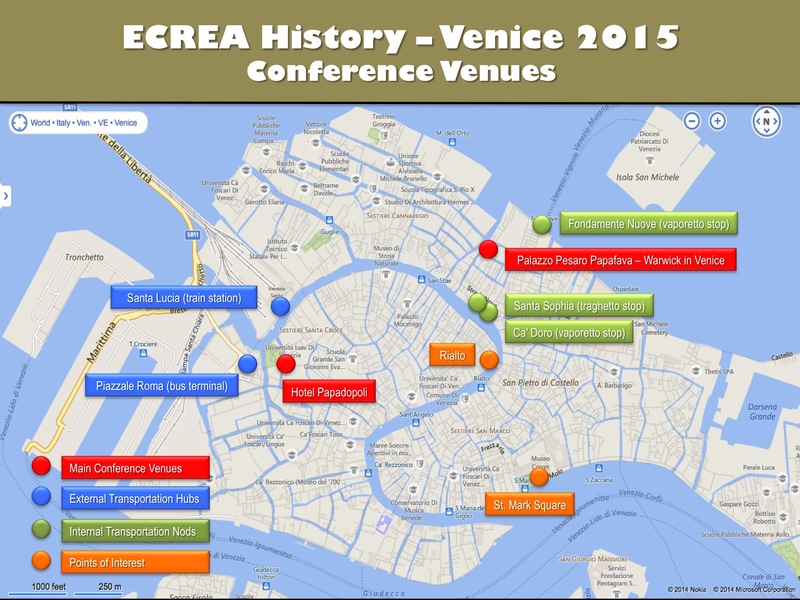 Abstracts should be saved as pdf documents and submitted through the conference website: https://ecreahistoryvenice2015.wordpress.com. Grand theories or meta-narratives often have at their core information networks and communication technologies. To what extent are theoretical premises advocated by scholars such as Braudel, Innis, McLuhan, Habermas, Luhmann, Benedict Anderson, Lefevbre – and more recently by Hallin and Mancini, Castells, Gitelman, Simonson, Mosco, Hendy, Hesmondalgh, Kittler, Fickers – applicable in historical inquiry? How has your own research in communication history been inspired by such concepts and theories? Communication networks and information technologies are always embedded in a material setting that can foster or hinder certain communication practices, call into being new forms of exchange, and drive technological development. What is the place of the geographical imagination in current communication history research? How valuable are the ideas of ‘place’ and ‘space’ in historical research? What are the current trends within the field of historical geography that can advance our understanding of communication history? How valuable is the idea of ‘the network’? What were the technologies that historically mediated the spread of information through networks? Who participated in networks used in advancing what Bourdieu later called cultural capital? To what extend did such networks contribute to the rise of public opinion and the public sphere? Can we talk about historical continuities between the early modern republic of letters and what Castells later popularized as the network society? In order to understand communication history as a long-term, inclusive process, which alternative media or communication technologies (besides the familiar ‘mass media’ of the 20th century) need to be considered, and how? Possibilities might include migration flows, civic and religious ceremonies, theatre, preaching, fashion, the visual arts or architecture. What kinds of methodological or theoretical implications does their consideration carry? The progressive digitization of archives and libraries is opening access to primary sources for increasingly wider circles of scholars. What are the advantages and challenges raised by this development? To what extent do issues of materiality matter particularly to the realm of media and human communication research? What are the most relevant sources that you use for your own research? At one time, even the oldest communication technologies were looked upon as suspicious novelties. Socrates famously condemned writing; the introduction of print may have been hailed by some as a ‘revolutionary’ enterprise – a term now often applied also to the digital age. What are the lessons that scholars can learn from studying critical periods during which one dominant technology is replaced by a new mode of communication? How do such lessons serve our understanding of the phenomenon called new media? Vittore Carpaccio: The Lion of St. Mark (1516). Doge’s Palace – Venice.